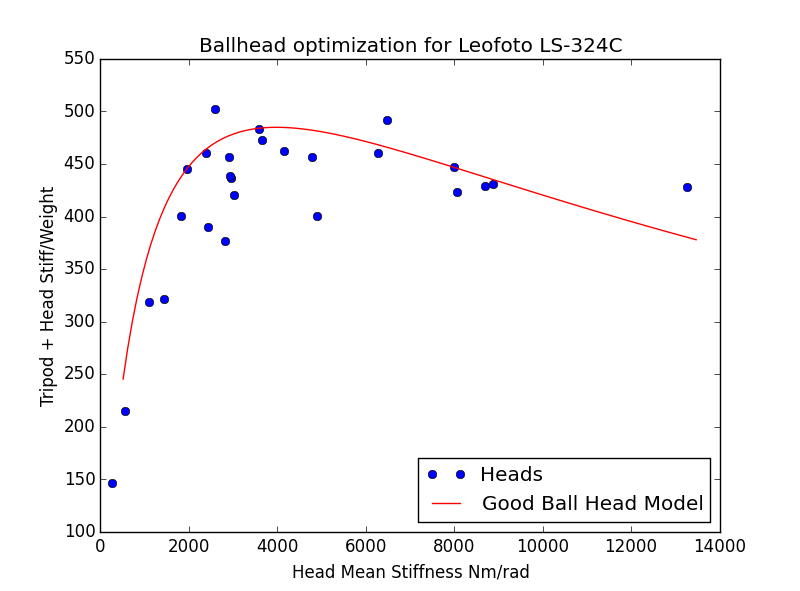 This chart is telling us that we want a ball head between 3000 -6000 Nm/rad in stiffness. Above that, the heads become too large and their increased stiffness doesn’t provide enough advantage to make up for their increased weight. The LS-324C wants a head that is firmly in the midsize range. I don’t recommend using most pan-tilt and geared heads on the LS-324C. These typically either aren’t stiff enough to maintain the performance of the legs or are too heavy and ruin the portability of the setup. The Leofoto G4 geared head is an exception and pairs nicely with these legs. While it isn’t anywhere near as stiff as a similarly sized ball head, the benefits of a geared head may outweigh that for you. Sirui K-20X: The Sirui K series heads all provide excellent stiffness/weight ratios, and the K-20X is the head most appropriately sized for the LS-324C. The larger and stiffer K-30X is also a good choice, but feels a bit bulky on top of these legs. While these heads aren’t perfect, they happen to be a good value, which I assume is of a priority for someone looking at these legs. Acratech GP: The size and stiffness of all of the Acratech heads match this tripod quite well. These heads feature an open design ideal for dirty outdoor conditions. However, its difficult to imagine dropping $400 on the head with these legs, but you may have good reason. Leofoto LH-40: The LH-40 is a blatant ripoff of the RRS BH-40, but it is an appropriately sized head for the LS-324C and is often included for an unbeatable price as part of a kit with the legs. Don’t expect the LH-40 to be just as good as the RRS BH-40, because it isn’t, but it can serve as an excellent companion to the LS-324C.